As a College that focuses on trying to ensure great results for every individual, and knowing that all our students and teachers have worked exceptionally hard in preparation for examinations. A-level Results Day is always a nervous wait. 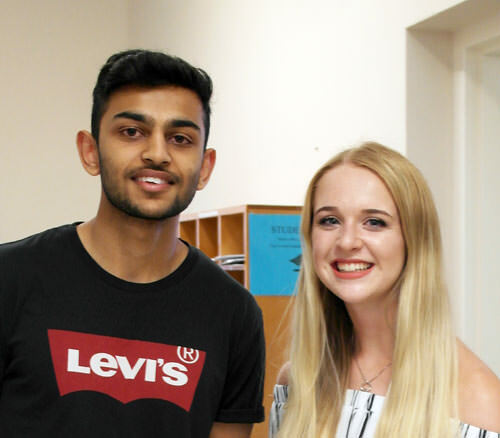 Therefore we are delighted to report this year’s results have yet again outperformed the UK national average with 71% achieving A* to B grades and 86% achieving A* to C grades. Debbie Chisom Ifeobu (Nigerian) A*A*A*Ab achieved in Chemistry, Maths, Further Maths, Physics and Economics and she has been accepted to read Engineering at Christ’s College, University of Cambridge. Trung Kien Nguyen (Vietnamese) A*A*A*B achieved in Chemistry, Maths, Further Maths and Physics and he has been accepted to read Chemical Engineering at University College London. The individual care and attention each student receives at the College will continue to ensure that each individual can fulfil their academic potential and we will remain proud to follow this year’s cohort as they progress and grow in their chosen fields. Nicole Gray and Masem Abbas are pictured below.